The arena stage during "14 On Fire"
I knew the original arena stage takes 30 large trucks to carry, because I have seen them all and counted them, like in Newark. So I was worried they would strip down and degenerate the arena experience. But not so! The most important part of the arena stage is the tongue pit. Visually you do only see the upper lip part before the show, as part of the backdrop screeen decorations. I think they drop the upper lips before show start, but I am not sure. I simply don't remember. Version 2 i.e. the Far East and Down Under arena stage is actually a low price improvement, because they have a larger screen that is improving the visuals for the fans all over the arena, while it does not look so "mouth & tongue" like vs the original. So when I am saying the arena stage is back, I mean in the way it is working for the fans. Truely it is not identical visual nor physical, but anyone who went to an arena show in 2012 or 2013 would experience the same feel of the arena tongue shape, which is the good news for all of the arena shows that are to come. I.e. the designers managed to improve the stage without loosing any parts of the basic function. On a side note, I think they got rid of some of the side ramps, that probably saved a few trucks, but unless 2/3 of the trucks were steel and stage fundaments, I really don't know how they manage to scale 30 trucks down into something that fits into airplane cargo! I am sure we can add some pictures here soon, but the good news are the arena stage is great! And no worries if you invested a lot in a pit ticket - or simply an arena ticket in general - you are in for a treat, and you will not regret it. And finally, for those who have been reading the Tokyo Dome reports, even if your show does not have the arena stage, that would not be the biggest problem of the tour - they are simply ... On Fire! Re: The arena stage during "14 On Fire"
The Rolling Stones performed the first arena show of the 14 On Fire tour tonight in Macau, China, featuring the same arena stage as used during the 2012-2013 shows. This of course is not entirely the case. The 'upper lip' is missing, as you can see in the JJF video. In 2012/2013 the upper lip was there for the first few songs. The idea of the circular ramp forming a part of the tongue-and-lip design logo is way less clear this way. Off course, not bringing the upper lip is cheaper. And naturally, ticketprices of arenashows give every reason to cut costs. source: the iorr.org O2/1 review page. Being in the venue I thought there maybe wasn't enough space for the upper lip. But if you compare thes photos you see there would have been. I can't see how the 2012/2013 stage would need 30 trucks and the 2014 one a lot less...there must be options to either loan the whole "setup" and then move it around or just carry the basics (in this case the floor possibly, mixing desk, lightning) and have the local promoters figure out the rest. Edited 1 time(s). Last edit at 2014-03-11 01:55 by gotdablouse. The 2012/2013 stage featured a half oval truss to hold lights which hung over the circumference of the tongue There was also three trusses over the the main part of the stage the closest one to the audience was at an angle like this "^" - That one held lights which shined on the lips. When the band did the song Paint It Black the lips were not lit and towards the end of the song the end of the lips would fold up and the whole thing would rise up into the rafters and deflate. This give a half circle visual of the video screen. When the band played Midnight Rambler the truss that was bent in a half circle at the bottom of the gold curtain would fold up into a straight line creating a giant square video screen. 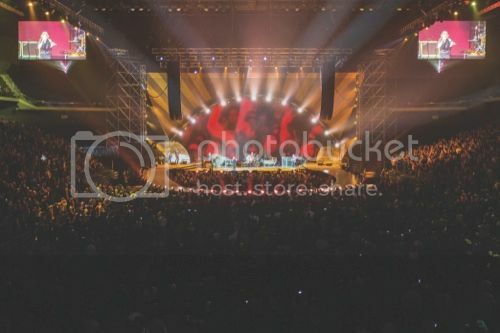 For the 2014 arena shows There are only three trusses above the stage and as you can see in the photos above there are just a steel silver color. Before they were painted black so a lot of the trusses for this tour were designed and probably built in the far east so all of the original trusses did not have to be shipped over. There is a different curtain used as well and they probably do not have as many on the crew unlike the US/UK shows where you can have all the extra gadgets to operate on the stage. In 2014 you can also see steel scaffolding on both sides of the stage as well which holds more lights. I actually meant the upper lip not just the teeth. On the pictures you see that the width of the upper lip does not exceed the 2 side elements of the lower lip. So width and height wise the upper lip would have fit into the Macau arena. I also can't see they would need 30 trucks for either of the stage versions. Maybe they dragged a lot of scaffolding rods about in the US, where it is cheaper to use local material if you have to fly somewhere. Another detail about Macau is that they did not hang all the PA from the ceiling. For the outer pair of PA speakers scaffoldings were built (not visible any more on the pic, where dismantling has started). Gee,the punters on this leg are getting a good deal-a downscaled production and 3/4 fewer songs for the same price as 2013! Edited 1 time(s). Last edit at 2014-03-11 07:01 by bonddm. the teeth had been different from the 5 concerts in 2012 to 2013. They skipped the blow teeth and only had them done on the screen. I can't recall all changes, but I am sure that their had done some changes from 12 to 13 to optimize the travel through the US/CA. I also assume that now all roofs can take such a load of PA systems. For that reason they might have taken the scaffoldings. Compare to the former Tonguepit and only judging from the photos the stage looks plain and less enclosed like a theatre style stage. 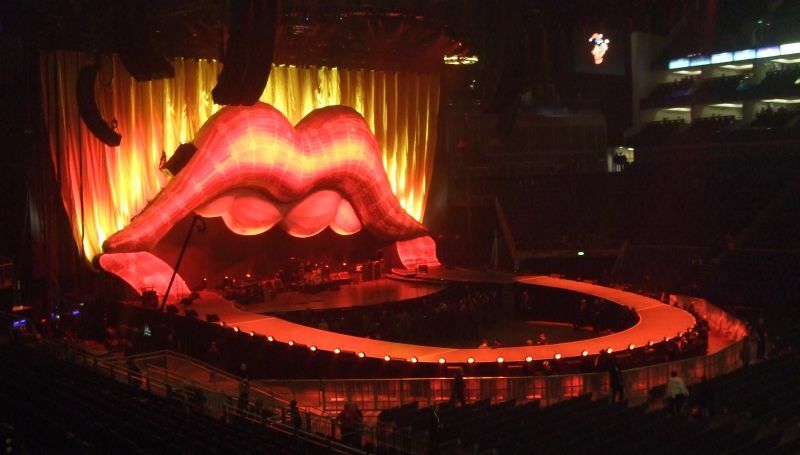 Compared to the tongue stage they used in 2012/13 the stage they are using now in Asia & Australia is simpler in design but looks a little cheap, IMO. It appears to be cobbled together from pieces of the original one along with some generic-looking platforms, ramps, truss and scaffolding. 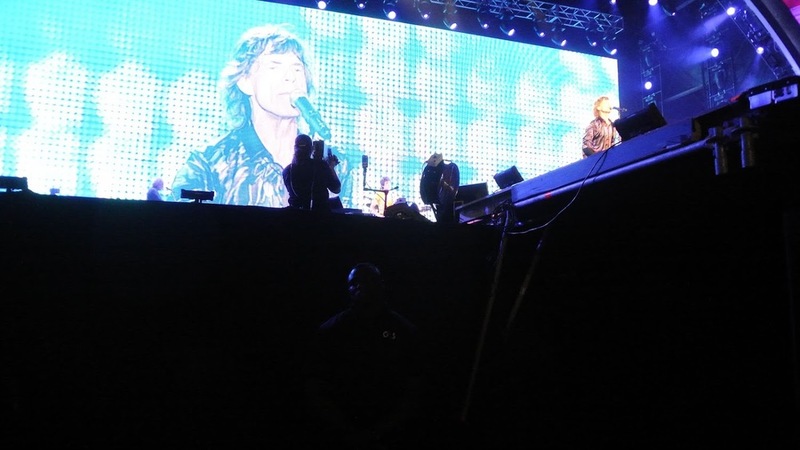 I realize they had to scale down on the show's production to make it easier and more cost-effective to travel with, but for the Stones it's not as fancy as you would come to expect...especially given the high ticket prices. However, I think they will probably go back to using the "lips and teeth" stage for the European dates this summer as they can more easily and cheaply transport it in trucks rather than by plane. Edited 2 time(s). Last edit at 2014-03-11 10:23 by TornAndFried. I actually prefer the stage without the "lips and teeth". For one thing, they serve no purpose except as a backdrop for a pre-show picture and second, they don't really look much like the real tongue logo. I also think that the intro is improved over the 50 and Counting Tour. The new approach, which just uses the pulsating red visual, is great - it builds anticipation for just the right amount of time and then the Stones hit the stage. I think it works. On the previous tour, the film plus the drums against a darkened stage backdrop just went on for too long in my view. I also think that the intro is improved over the 50 and Counting Tour. The new approach, which just uses the pulsating red visual, is great - it builds anticipation for just the right amount of time and then the Stones hit the stage. I think it works. On the previous tour, the film plus the drums against a darkened stage backdrop just went on for too long in my view. I haven't seen a video of the opening sequence for any of the Asian shows gets but I'll check it out. I also thought the opening for the 2012/13 shows went on too long and it was a little anti-climactic when the band finally came onstage. Glad to hear they streamlined that. Now if they could only improve on the dull setlists! Edited 5 time(s). Last edit at 2014-03-11 16:21 by TornAndFried. Lips and teeth for Europe please!!!!!! Would they be in storage in the US at this point? Yes. Tounge and Lips & Teeth for Europe please! Please not the stage like in Abu-Dhabi! Edited 1 time(s). Last edit at 2014-03-13 04:30 by bv. Thanks for separating this subject off into a separate thread. I feel it's worth discussing, for it might add to the value for money part, for as much as possible that is, if we lobby for it for Europe. For the festival, stadium and outdoor gigs however, they'll probably not use the lips anyway. Yowza harald2002, they should of dished out some stilts. 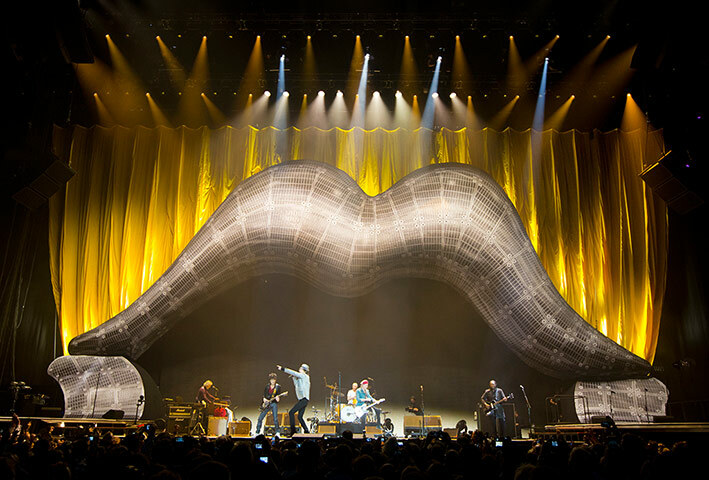 It's very likely the tongue and lips stage will see more action this summer in Europe - at least for any arena shows. That stage was custom-built and cost millions of dollars. And it's practically new having only been used for about 20 shows so far so my guess is it will be around for the rest of the Stones' touring days. Edited 4 time(s). Last edit at 2014-03-13 06:37 by TornAndFried. And a Lick or two! I'm not sure where the "50 and Counting" stage is at the moment. It might be at the warehouse of the company that built it (Tait Towers in Pennsylvania, USA). Or it could be in storage somewhere in England. In any case, it's very likely it will see more action this summer in Europe - at least for the arena shows. That stage was custom-built and cost millions of dollars. And it's practically new having only been used for about 20 shows so far so it wouldn't make sense to scrap it. My guess is it will be around for the rest of the Stones' touring days. EDIT: Telenor Arena is now the most likely venue. Edited 1 time(s). Last edit at 2014-03-12 23:44 by DandelionPowderman. I'm not sure where the "50 and Counting" stage is at the moment. Well, it appears to be in Shanghai . Why it's not used at every arena show one can only guess right now. Maybe there were problems shipping it into Macau? Or they have one set of upperlips only which can't be used everywhere due to the short interval in between shows? Or it is valued per show if it's feasible costwise? Or some other restrictions regarding importing stuff, or logistical issues, or...? I was surprised to see the tongue and lips stage at the show in Shanghai. I'm not sure why it wasn't also used in Macau but my guess is either the arena floor there was too small to accomodate it, or the logistics of getting it in and out of Macau and fly it to Shanghai were too difficult to do in the short time they had. In any case I think it's likely we will see it again in Australia. As for the actual stage I doubt they'll do anything better than that "fire oval" with red and white sheets stretched around the stage, I mean why would they? There hasn't really been an outcry so far in places that matter, like the media.